This attractive Wiveton Summerhouse was recently delivered and installed at our customer’s address by our expert, in-house fitting team. Designed and hand-built in Norfolk using only FSC® certified timber, the building measures 3.6 x 3.6m and is clad with smooth shiplap. Internally, the summerhouse benefits from insulation and natural lining on both the walls and ceiling, with an electrical pack meaning appliances and lighting can be used all year-round. There are eight opening windows featuring leaded glass for a more traditional look and the distinctive octagonal roof is covered with cedar shingles. 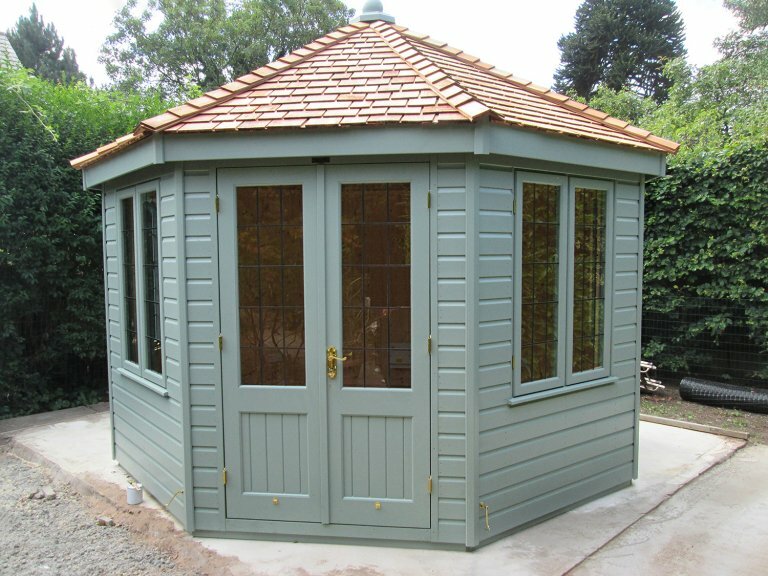 The Summerhouse is painted in the exterior shade of Sage, which the customer selected from our vast range of exterior finish options, including a Farrow and Ball palette. If you would like to see our range of Summerhouses for yourself, the best way to do so is by visiting one of our showsites. With several based across the country, you can expect to find up to 25 different display buildings and a team of friendly advisors on hand to assist you or answer any questions you might have. Locate your nearest showsite here. Alternatively, you are welcome to get in touch with us or simply browse our Summerhouse range online.